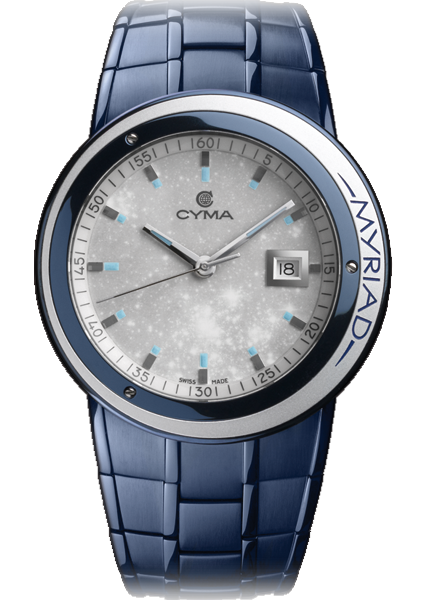 One of the new watch collections for 2011 that won’t be easy to find is the “Myriad” collection from Swiss brand Cyma. While brands usually amuse/irritate me when they come up with new names for their products, Cyma actually put some thought into this one. “Myriad,” as a word refers to a really large or indefinite number. 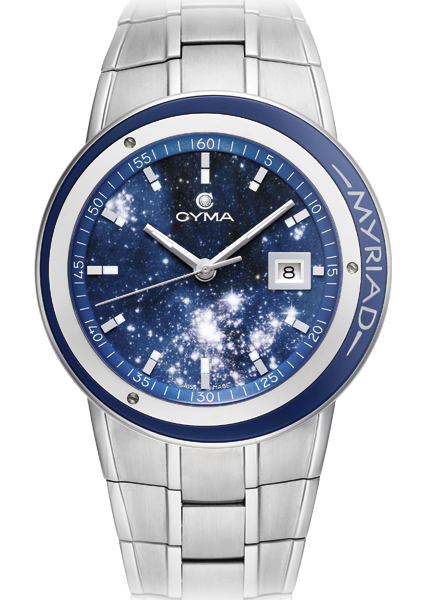 The dials of the pieces have either a starry image of the “infinite” universe, or a light motif that Cyma simply calls their “infinity rhodium” dial. Like the limitlessness of space, so to is the name of the collection. Really happy Cyma didn’t call the collection “Le Big Blue Bucket” or something else (adding of course the requisite accent marks all over the words). The collection comes in three ranges, being the “Chrono New World, Chrono Fascination, and City Watch.” And not the names start to confuse me… The only “non universe” piece is the limited edition model called the Chrono New World. 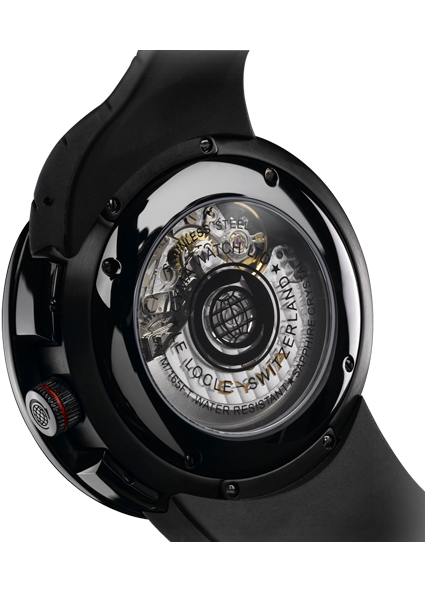 It has this special myriad watch shape, but in a black case with a Swiss Valjoux 7750 movement in it. More on that in a sec. The basic watch is the Myriad City Watch – this has a Ronda quartz movement and a 44mm wide case. 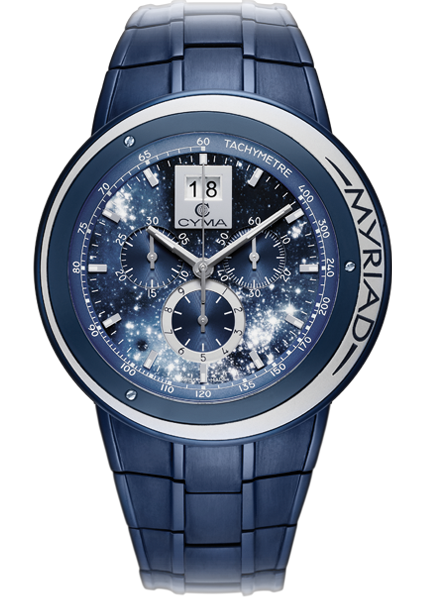 The concept of the myriad watch gives it an integrated bracelet and asymmetrical bezel. Consider these pieces to be high-end quartz. The case is either in polished steel or blue PVD coated steel. According to Cyma literature, the bezel rotates – though I can’t imagine why. The City Watch also comes in a ladies’ variant that is about 37mm wide. Dials for the collection include the universe one that has lots of SuperLumiNova in it glow. This one looks like a snapshot taken from the Hubble telescope. The other dial option is lighter, but looks to be made from the other dial. This one is rhodium toned and like a picture of the universe if taken from one of those telescopes that picks up other types of light. The hour markers and hands are applied and stand hour nicely. I like the thick frame around the date window. The dials have sapphire crystals and a lot of character. While these aren’t astrological watches exactly, they do have that feel. 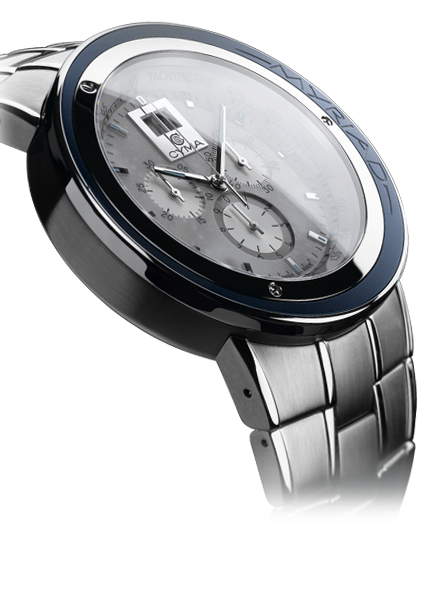 Along with the three-hand City Watch collection, there is the Chrono Fascination models. So chronologically fascinating! These models for men only have large cases that are 48.5mm wide and a bit over 15mm thick. Big watches! Same dial/case variants, but with a Ronda quartz chronograph movement that has a big date indicator. I know this movement (calibre 5040B) and have enjoyed it in the past. For me, the best lookers have the polished steel case and blue dials. Really nifty “spacey” look. 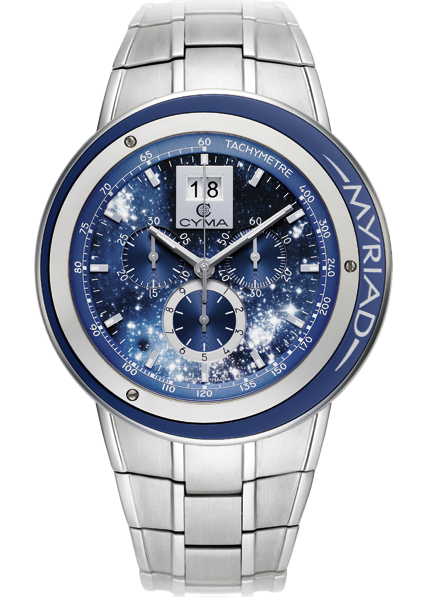 There of course is also the really neat looking mechanical Chrono New World. 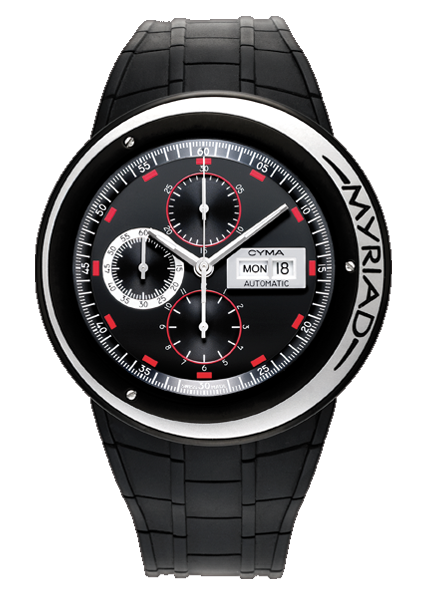 With an automatic Valjoux 7750 chronograph movement, this black and red version of the myriad is really the strongest looker of the bunch. The case and dial work well together, and it should look impressive at 48.5mm wide on the wrist. Price for the Chrono New World is 2,690 Swiss Francs. Prices for the City Watch and Chrono Fascination range from about 1,000 – 1,500 Swiss Francs. I look forward to checking these guys out soon. See CYMA watches on eBay here. See CYMA watches on Amazon here. it’s written right there on the bezel. Yea, little whoops there. All better now. I don’t know a lot about Cyma, it’s one of those brands that I just never see. I thought they were focused mainly on the Asian markets, but with 48mm offerings, looks like I’m wrong. Really dig the blue PVD – very unique. Beautiful watch and nice design. 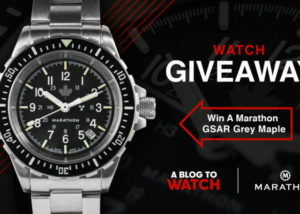 I assume the watchband is poly or stainless. Does the rotating bezel allow easier access to the crown for setting the time? The only issue I have is $2800 for a quartz watch? And, the Swiss Ronda 5040B is used in Invictia watches costing much less. The watch is steel, and the blue model is PVD coated steel. The $2,800 model has an automatic chronograph Valjoux 7750 movement in it. Thanks for the clarification. Blue model is PVD coated steel is cool. 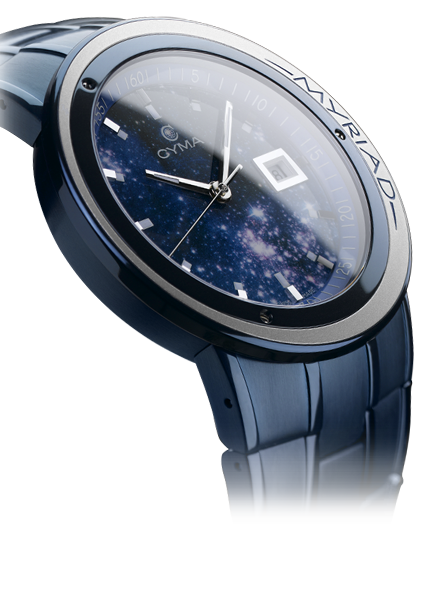 I think the PVD blue is novel and interesting, though the -MYRIAD- branding on the bezel is a deal breaker for me. I don’t mind subtle branding, but this is a lot of real estate for the name of a watch. I struggle to think of another “serious” brand (outside of G-SHOCK and other novelties) that’s doing something similar with the outsized branding. The difference being that my G-Shock wouldn’t look as good without the blatent branding, and this Cyma would be complimented by it’s removal. Credit to Cyma for trying to stand out, obviously something they need to do as they are quite invisible at the moment. I like the fact the bezel rotates to allow access to the crown but find the lettering a major eye saw, worse than BVLGARI even and sort of gives the watch a kind of yachting look (well almost) but with a few tweaks this may have potential to become the most “iconic” of new Cyma models. blue PVD = very cool. Is there any statistics relating to correlation between case size and nationality and/or age groups out there? Nothing interests more me in the watch world as to how companies decide what size to make there watches and why. 48 x 15 is a beast, not sure many “ruggedly built men” (who wear such sizes- just to add) would want to wear a dial design that looks like a romantic starry night. Even so i like this i think but is it just me or do some of the screws on the inner part of the bezel look like they don’t line up with the hour markers? that would grate on me, unless that part moves with the outer bezel area of course. 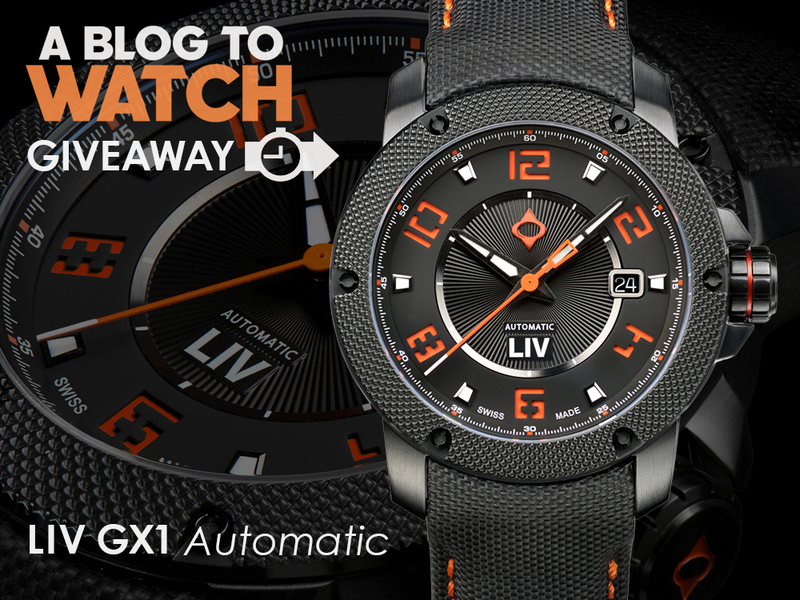 Very nice watches ! According to their websites (www.myriad.ch), it seems that the bezel is a new inovation from their own : it protect the crown and the chronograph of a non-intentional activity. As they explain, when the bezel is like you see in the pictures, the crown and chronograph are blocked, and you have to rotate the bezel to releave them. I think it’s a really interesting concept – simply but never thought before.. 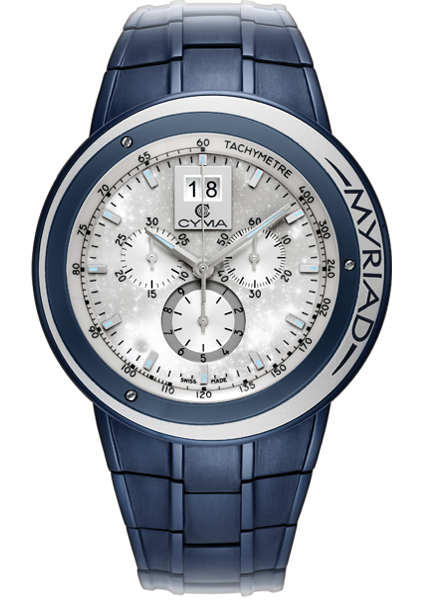 I known Cyma watches because they were well reprensentated on Baselworld fair last few years, and as I bought one of their New Signature collection last year I can say that they are making a really good job. Watches are manufactured in Le Locle (of course it bears ETA movments), the finition is just amazing and the price is lower than prices of their concurrents. As they made a new website for their watches (www.cyma.ch) you can now read their very interesting history and also buy the watches online. The only thing that I can reproach to Cyma is that they don’t make a lot of advertising but according to them, they’re not here to make a lot of ads.. But just to make good watches with good prices.. And I think it’s a pretty good state of mind for such a brand.